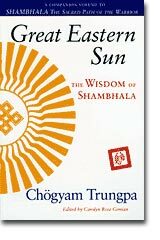 "Great Eastern Sun The Wisdom of Shambhala"
The journey that began in Shambhala: The Sacred Path of the Warrior reaches a new level of intimacy and depth in this book, based on talks Chögyam Trungpa gave in the last ten years of his life. Trungpa possessed uncanny insight into our deepest fears, and how these are heightened by the pressures of today's society. He addresses many of them here: the speed and alienation of modern life; depression; materialism; aggression, anger, and anxiety; and a crippling lack of self-worth. Trungpa also held an unshakable belief in human goodness and our ability to create an enlightened human society. His most ardent message is that each of us is a genuine and powerful individual who can help this world. Throughout the book, he evokes the image of a spark or dot of goodness that is always available to us - the fuse for igniting warriorship in our lives. In every line of this extraordinary and uplifting collection, he challenges us to embrace life and to find the Great Eastern Sun, the spark of sacredness and health in every moment.